Below are the official 2017 Hockomock League Volleyball All Stars, selected by the coaches in the league. #8 King Philip, 1 @ #1 Brockton, 6 – Final – Click here for a photo gallery of this game. #3 North Attleboro vs. #19 Medfield – Postponed to Tuesday, 11/7 at 2:00. #2 King Philip, 5 vs. #7 Needham, 2 – Final – King Philip senior Liz Furfari scored a pair of goals inside the final five minutes of the first half create a two-goal cushion for the Warriors, a lead they never let up. Nicole Connor opened the scoring before Needham tied the game. In the second half, Raegan Simeone and Christina Hathaway added to the Warriors’ lead. Furfari also had a pair of assists in the win, Hathaway had one and Alli Meehan finished with two helpers. #2 King Philip advances to play #6 Duxbury in the D1 South Semifinal on Wednesday, at 7:00 at home. Duxbury beat #2 Walpole, 3-2, in overtime. #4 Canton, 3 vs. #12 Barnstable, 2 – Final – Canton scored a pair of goals in the first ten minutes, but needed a late goal to break the tie and earn the win over Barnstable. Andrea McNeil put the Bulldogs up 1-0 and Maria Femia doubled the lead at the ten minute mark. Barnstable cut the deficit to one just before half, and then tied the game with 12 minutes to play. Sophomore Kaitlyn Goyetch scored the game-winner for the second straight game, converting a corner with five minutes to play. #4 Canton advances to play #1 Somerset-Berkley in the D1 South Semifinal on Wednesday, with a time to be announced. 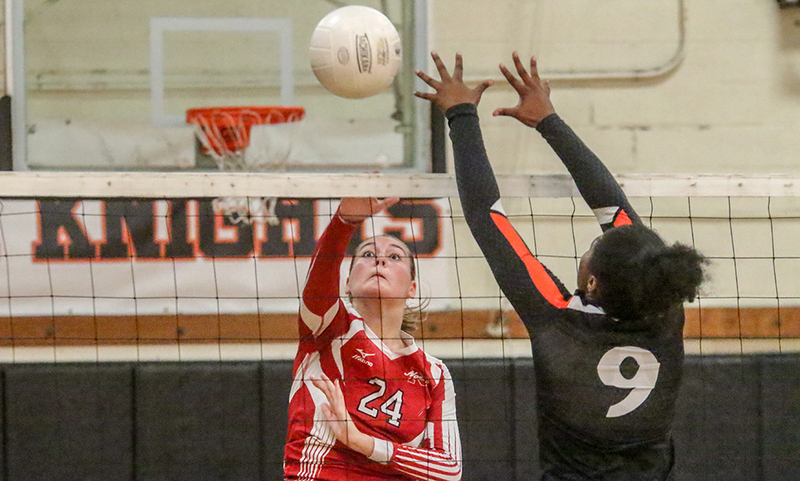 #4 North Attleboro, 3 vs. #5 Walpole, 1 – Final – North Attleboro opened its tournament run with a 25-10, 25-19, 23-25, 25-16 win over visiting Walpole. Amelia Murphy had a terrific night at the net, putting down 17 kills along with two blocks, plus three aces. Kezia De La Cruz added 12 kills and six aces and middle Tori Melanson had eight kills, six blocks and three aces in the win. #4 North Attleboro advances to play at #1 Barnstable on Wednesday, at 6:00. 1Q: (T) T.J. Mendes 53-yard run, John Teixeira XP good; (A) Cam Furtado 7-yard pass to James Weir, C. Furtado to Justin Cote 2-point conversion. 2Q: (A) C. Furtado 6-yard run, C. Furtado 2-point conversion; (T) Noah Leonard 21-yard pass to Collin Hunter, J. Teixeira XP good; (A) C. Furtado 13-yard pass to Elvin Sam, J. Cote 2-point conversion. 3Q: (A) Alex Rodriguez 7-yard run, E. Sam 2-point conversion; (T) N. Leonard 41-yard pass to Brayden Merrill, J. Teixeira XP good; (A) J. Cote 1-yard run, Conversion no good. 4Q: (A) Nathan Barboza 1-yard run; Tyler Evans XP good. 1st Quarter: (NA) Brendan McHugh 2-yard rush, 2pt failed; (NA) Chad Peterson 4-yard rush, Geoff Wilson XP good. 2nd Quarter: (NA) B. McHugh 1-yard rush, G. Wilson XP good. 3rd Quarter: (M) Colby Pires 14-yard pass to Tyler Joyce, XP missed. 4th Quarter: (NA) C. Peterson 20-yard pass to Nolan Buckley, G. Wilson XP good. Stoughton, 1 vs. Norwood, 1 – Final – Chinazo Odunze scored the Black Knights’ goal off an assist by freshman Mackenzie Manning. Stoughton coach Tara Daniels said Victoria Fallon played a “great game” in defense. 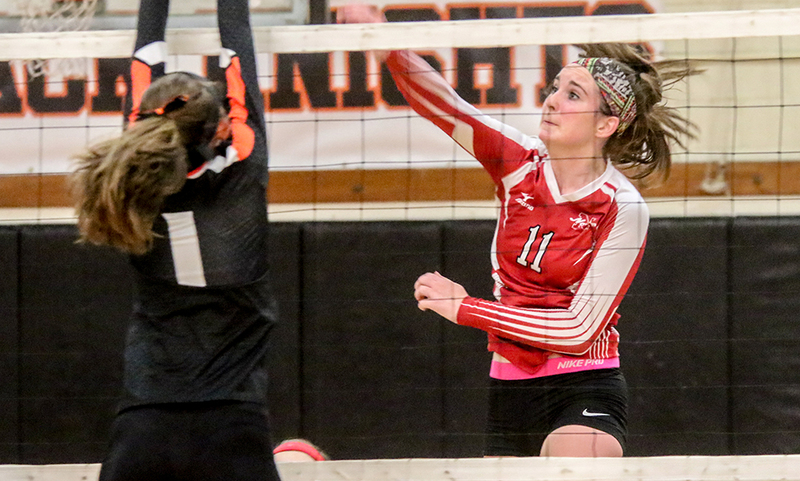 Milford, 0 @ North Attleboro, 3 – Final – North Attleboro defended its home court with a sweep, winning 25-10, 25-10, 25-20. Kezia De La Cruz had 11 kills while Amelia Murphy finished with 10 kills. Anna Caristi added eight kills and three blocks in the win.